Today we are hosting a Health and Safety day across our entire UK operations along with our partner companies within Bouygues Construction in the UK. This includes Bouygues UK, Linkcity, Bouygues Travaux Publics and VSL. It demonstrates our longstanding commitment to the health and safety of our 4,000 plus employees. Every member of staff is attending a Health and Safety session at over 100 of our sites and offices to hear about our shared ambition to achieve the highest standards of health and safety. 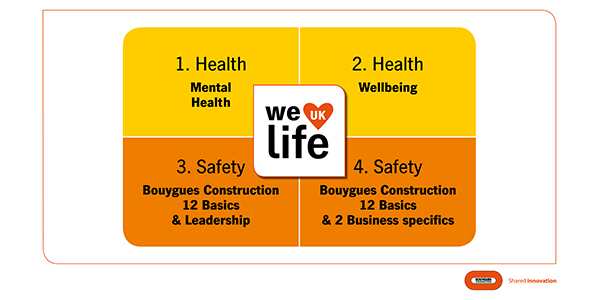 This UK health and safety day follows on from the launch of Bouygues Construction’s Global Health and Safety Day hosted in June 2017 which took place across our entire global construction network – some 100,000 people in 80 countries – to launch the 12 health and safety basics to all worksites around the world. “The health and safety of everyone engaged in a Bouygues Construction workplace is of paramount importance. This event provides an opportunity for each of us to revisit our individual commitment to health and safety, as well as to reflect on the behaviours of others around us. “Health and safety plays a key role in every aspect of life; at work and at home; it’s a mind-set and focussing on and improving upon our health and safety culture is everyone’s responsibility.